East Coast Wings + Grill caters to chicken wing lovers by offering dozens of different chicken wing flavors that can be paired with eight heat intensities—resulting in hundreds of delicious choices. The extensive menu also includes salads, wraps, sandwiches, burgers and more. The atmosphere is relaxed, family friendly, with plenty of TVs to watch all your favorite events with a large craft beer menu and a full bar. East Coast Wings is committed to only using the highest quality ingredients. The jumbo wings are fresh, never frozen. The sauces are prepared in-house and mixed to order. The chips are hand sliced from Idaho potatoes and cooked in small batches throughout the day. All of this attention to detail makes the food delicious and East Coast Wings + Grill customers coming back for more. 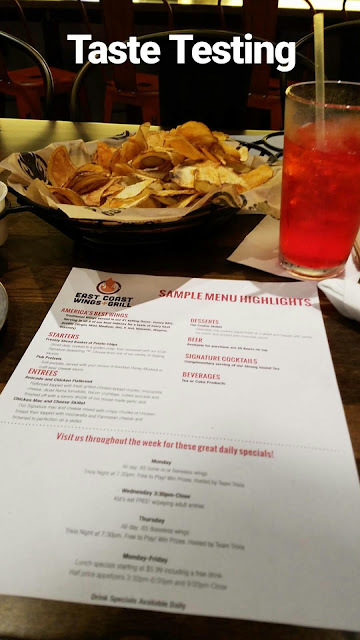 The girls and I had an evening out last week trying different dishes at East Coast Wings + Grill, along with a few other bloggers and a newscaster. There use to be a location right down the street from my house that was open for a little over a year, but now close. I have never visited the one that was near me because I'm not into eating chicken wings, well more so not like eating fried chicken. But I was curious to know why the location near my home shut down, so when I went to East Coast Wings media event in Downtown Atlanta, I just had to know the scoop about the closure. Come to find out the reason they closed is that they didn't have enough foot traffic, plus the area East Coast Wings were in wasn't a good niche for them, so they transferred to the location they're at now. I can understand that location wasn't good at all, you could hardly see the restaurant driving pass, plus there is so many different wing restaurants in my area, so heavy competition. Good thing it was because of that, and not because the food wasn't good. Since I'm not a fan of fried chicken, my girls were the perfect companions to bring to give me an unbiased opinion. The new location of East Coast Wings is just right since it's near Georgia Tech College with a lot of students walking around. The restaurant is easily seen, with street parking in front and a parking garage around the corner. The eaterie is the perfect spot to chill with friends, have a drink, watch sporting events, or have a meal with your family. 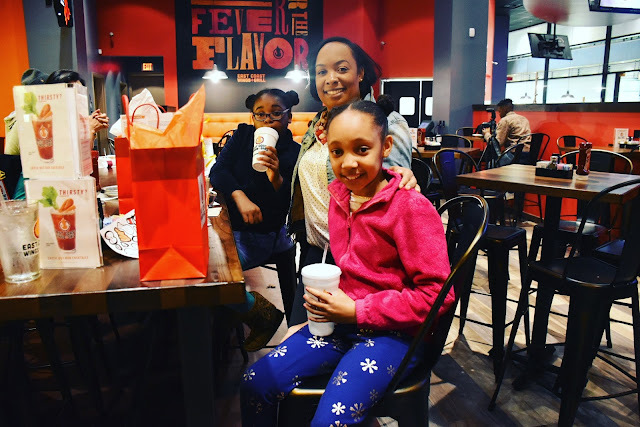 Browsing through their menu, East Coast Wings is more than just eating wings; there are other options to choose from like burgers, tacos, salads, sandwiches, and wraps. While settled in our seats, we were given several different samples from the menu. Now, East Coast Wings is not the typical bar food; you know the food at run down bars that only tastes good when you're drunk, LOL! The food is fresh, well prepared and flavorful. From the appetizers to the main dish which was the wings, it was all tasty. I asked the girls what their opinion of the wings was, and they said it was good, could've used a little more honey bbq sauce, but that's their only complaint. And you know what? We were given several different heat intense wings, from mild to scorching hot. I kept with the mild wings. However, the girls were the only two daring enough to try the hottest of the hot wings. Lauren took a bite, and it didn't faze her. I looked at her in shocked like, "Are you okay?" She nodded yes. Now, Michelle took a bite and quickly spit it out and was yelling for water! She ran across the restaurant to the bathroom washing her mouth out with water. LOL!!! The manager was warning the girls not to try the blazing hot wings, but those girls wanted to show that they could manage it. If you're like me, have kids and looking to save a buck or two while eating out, at East Coast Wings kids 12 and younger get a free kids meal with each paying adult meal. It just so happens to be Wednesday that day, and the girls also got to choose meals from the kid's menu free. They got their usual when ordering wings, Teriyaki (Teri-Ginger) wings with fries. The girls thought their wings were delish, however, thought the fries needed better seasoning. I took a bite of their fries and enjoyed them; they must not have liked it because it wasn't salty. Salty fries is not good for people to eat anyway. Whenever you're visiting Downtown Atlanta, make sure to stop by East Coast Wings + Grill, and taste the goodness. It's been awhile since I've last done a giveaway. Let's kick off 2017 with one lucky ProductReviewMom.com reader winning a $60 East Coast Wings + Grill gift card! Yay!!!! Giveaway ends on 2/28. How do you like your wings, mild or hot? Wow that looks soo good! Wish we had East Coast wings here! I like sweet n spicy, not sure I could handle those Spicy ones though! lol That cookie skillet looks tasty though! wow!Lot of food choices and look so delicious! You guys were able to try out some nice dishes. We need something like that here.